Running the Boston Marathon is the ultimate goal for any long-distance runner. On April 20, 2015, I – a mere mortal runner – got to do it. Of course there’s a lot more to the story, so here it is. There are two common ways to get into Boston. One is by running a qualifying time at an approved marathon somewhere else prior to registering. Qualifying times vary by gender and age, but they all have one thing in common: you have to be fast to achieve them. Very fast. And since I’m not, this method was not an option for me. The second way is to run for charity. Race organizers grant a certain number of entries to non-profit organizations which in turn give the spots to individuals who commit to raising funds for them. But getting on a charity team is also difficult, as there are many times more applicants than there are bibs. My personal journey started long before the race… in fact a couple decades before, depending on how you look at it. Unfortunately, it’s a sad one. In 2005, the world lost an amazing young man named David Goldstein to a 14-year battle with cancer. Although I never met David, I’ve heard a great deal about him from his brother Gregg, who is my co-worker, and their father Mark. During his illness, David received care from Massachusetts General Hospital, where the family lived at the time. 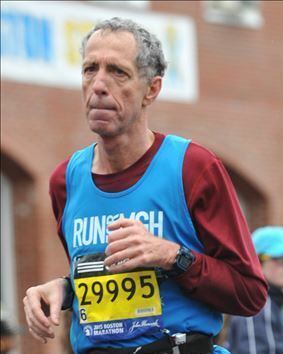 David’s doctor, it turns out, is a marathon runner and heads up the Boston Marathon fund-raising team for MGH Pediatric Oncology. To make the long story shorter, Mark and Gregg Goldstein reached out to Dr. Weinstein who has never forgotten David and the family, and asked if I could run in memory of David on the tenth anniversary of his passing. The doctor agreed and I was in. My fund-raising commitment was $5,000, or MGH would charge my credit card for the difference. It was very humbling to see family and friends of both myself and the Goldsteins, plus many members of the running club I’m in come through with a huge $9,686 in donations. These ranged from $10 to $501 — from college students who I know couldn’t afford it to corporations which voluntarily reduced their profits to help. A marathon training cycle lasts 16 weeks. I took it seriously and was very consistent in my workouts despite a heavy travel schedule, logging over 550 miles including a 22-miler in Boston on the actual marathon route. My typical week consisted of five to eight easy miles on Monday, a high intensity track workout Tuesday, hill repeats on Thursday, and a long run – anywhere between 14 and 22 miles – on Saturday. And here I must thank my coach Terri Swanson for advice, motivation, and creating the training plan, plus members of the Runner’s Depot Training Team in Fort Lauderdale for their encouragement, support, and companionship on those early mornings. I made it to the starting line healthy and confident, which is all a coach and running buddies can do. Boston is an amazing experience. Although I’d run seven previous marathons, nothing has the larger than life feeling of this one. Beginning with Logan Airport, the city was all about the race. There were signs of welcome and congratulations everywhere, volunteers all around providing information, companies handing out samples of various products, etc. And there were runners … kindred spirits in the hotels, malls, restaurants, and on the streets. Major marathons have what’s known as an Expo in the couple days prior. Think of a trade convention full of products for runners. Boston’s was enormous, with every manufacturer represented. That’s where I picked up my bib and official shirt. It’s also where I spent a good deal of money on several pieces of apparel sporting the marathon logo. This included the famous Boston Marathon jacket – the most coveted piece of apparel in the running community. I did not, however, wear any of these before I finished the race, due to equal doses of superstition and respect I guess. My travel agent, Linda, who doubles as my wife, had chosen a hotel right in the middle of things, so we were able to look out the window and see related festivities. That, resting, and walking around like tourists took up the time we were in the city prior to marathon day. Linda ran the 5K race which took place on Saturday morning. I was pleased for her as she crossed the finish line in a good time. Ironically it was her motivation that got me to sign up for my first 5K not that many years ago, when I could barely make it a quarter mile without stopping. Mass General Hospital had a pasta dinner Sunday night. It was quite an emotional time and I shed tears as I heard stories of the brave young people currently or previously enduring life with cancer, with various outcomes from celebratory to fatal. Mark and Gregg Goldstein came all the way from Florida to be there and to cheer me on in the race. That was very special. Monday, April 20 … race day. (The Boston Marathon always takes place on Patriot’s Day, a holiday in Massachusetts.) One thing nobody could control was the weather. It was 45 degrees, windy, and raining. Later I was told that the “feels like” temperature was 32. All marathons are 26.2 miles, and Boston is what’s called a “point to point” course, meaning that you start one place and finish somewhere else. (As opposed to a loop or out and back course, where the start and finish lines are at the same place.) I got up early and walked half a mile to Boston Common, where the busses are loaded that take runners to the starting line in Hopkinton. Not surprisingly, there were more than enough pleasant volunteers and everything was extremely well organized. The bus ride to the start area seemed incredibly long. I couldn’t help feeling a little concerned about having to go all the way back under my own power. Race day jitters. Eventually we arrived at Hopkinton. The next order of business was to await my start time. Races with so many participants start in waves. The faster runners take off first so they won’t be held up by slower folk. I was assigned one of the latter waves, so I’d be hanging out awhile. Another one of the perks of being on the MGH team was that they had arranged a special place for all of us to wait. Rather than sitting on the wet ground (the experienced bring a garbage bag or piece of cardboard) among the hordes at Athlete’s Village (a Middle School athletic field), I walked a hundred yards down the block to a special private enclosed tent. It had heaters, food, sport drink, and the ultimate pre-race luxury, porta-potties with no lines. Hallelujah. When my wave was called, close to 100 MGH runners walked to the actual start line. Soon I heard the announcer tell us that we could begin our 26.2 mile trek. Due to the cold, I had employed the common practice of wearing sweat pants, hat, gloves, and extra outer t-shirts purchased at thrift stores for the specific purpose of being discarded once the race starts and the runner begins warming up. I tossed everything except the hat and gloves into one of the many bins put out by Salvation Army for just that reason, and off I went. My previous PR (Personal Record) was 4:44:38, which is a 10:51 per mile pace. I told myself that if I could get close to that I’d be thrilled, and with anything under five hours I’d go home happy. The Boston Marathon course is notorious for its hills. It’s the uphills that get a bad rep, but the downhills provide physical and mental challenges of their own. From mile four to nearly 17, the course is basically straight with just enough rolling terrain to make it interesting. I couldn’t believe how good I felt. Without hardly ever looking at my GPS watch between miles, my splits were extremely consistent – 10:16, 10:20, 10:18. Those were the glory miles, when I was in a zone and cruising. The crowd support seemed incredible. Screaming people lined the entire course despite the cold, wind, and rain. Runners who’ve done Boston before tell me that the weather did affect the number of cheerers, but it was still amazing to me. As a Mass General Hospital charity runner, I was wearing a shirt supplied by them, with their logo on the front. People yelled all along the way “Go Mass General”, “Go MGH”, etc. The encouragement was helpful. It was also very emotional, and I cried a bit as I ran, my mind moving toward David Goldstein, in whose memory I was running. Somewhere around mile 12 or 13 were the famous Wellesley College girls. It’s a tradition dating back 100 years or so that these students kiss runners as they come by. Dozens of co-eds were holding signs that said “Kiss Me I’m _____.” fill in the blank … “A Senior”, “An Engineering Major”, “Asian”, “From St. Louis”, or whatever. Although I saw many men indulging, I abstained. Also around this time I realized that my stocking cap and gloves were drenched in ice water and doing me more harm than good. (It was still raining.) I tossed them to the side of the road, which is a very acceptable practice. Someone would pick them up and donate them to charity. At about mile 16.5 the painful climbing begins. Boston is known for a series of four hills starting at the Newton fire station, and ending with the famous Heartbreak Hill that crests at mile 21. The hills aren’t really that steep or long, but they come at a point in the race where you’re definitely fatigued. Fortunately I was able to get through them, though I did slow a good bit. I had been told that Massachusetts General Hospital had a specific area of cheering spectators at mile 20. They told me to look for the MGH t-shirts, the same color blue as the singlet I was wearing. I approached, but not a blue t-shirt in sight. Fortunately I saw Gregg and Mark Goldstein, as well as my wife Linda. They had on the blue t-shirts alright, but under heavy coats. It felt far colder to them, standing stationery, than to me running for hours. When I stopped to give quick hugs and hellos I felt my calf muscles tighten. Oh no! Was I about to cramp? I had to keep moving, so the visit lasted only a second. Mile 21 – the top of Heartbreak Hill. Running friends told me that the course was almost all downhill from here. They lied. Looking ahead I kept seeing another incline – and another incline – and then another stinking, rotten incline. These might have been just highway overpasses or slight hills, but I was ready to be done with increasing elevations. Yeah, 21 to the end was tough. The headwind, which had been with me the whole way, really picked up during those miles as well. Supposedly it reached about 22 miles per hour. I switched my GPS running watch to what I call the Zombie Screen. That’s the one that shows only distance. I no longer cared about current pace, average pace, heart rate, or anything else. At that point, all I wanted was to finish. Very notable for the last five miles were the crowds. Wow. The cheers were so loud that it nearly hurt my ears. Any thought I might have had of walking, even for a few feet, went away quickly, lest the mob turn on me. Top of mind also were those 130 donors who gave generously to my fund raiser. I had to finish for their sake as well. The running community has a phrase that’s kind of an inside joke. It goes “Right on Hereford, left on Boylston.” That describes the final two turns of the Boston Marathon route, covering the last three quarters of a mile or so. Finally, I was there, making the right on Hereford. With unbelief I stared at another slight rise in the terrain. Give me a break! Left on Boylston. Only about a quarter mile to go. Everything from my waist down was screaming. Again, wonderful volunteers gave or offered me a bottle of water, a banana, other snacks (which I didn’t take, as my stomach wasn’t up to it), and a finisher’s medal that I will cherish forever. Yes, I ran the Boston Marathon. Me. All 26.2 miles. It’s exciting to think about and an accomplishment of which I’m pleased. But I’ll never lose sight of why I was there … because many young people and families – one in particular – endure and endured the horror of a terrible disease. The Goldsteins have expressed appreciation to me many times for honoring David in this way, though I don’t deserve it. I’m glad I had the experience, but even more glad that I helped in a small way, financial and otherwise, to support some very special people. That made this race much more meaningful.